A Back Brace Is Essential For Pain Control and Core Retraining. There are various ways to manage back pain, pain medication, exercises, treatment, and a back brace. The back brace is an ideal do no harm solution for horse riders. Put the brace on while you ride and work around horses. Most back injuries are a result of micro repetitive traumas such as lifting, jarring, bending, twisting and sitting. Looking after a horse involves all of these movements. Pain from your back will inhibit the core. This slowly affects your riding skills, balance, and confidence. Sadly many horse riders give up. Many riders are told to stop riding by their Dr. or Physio. If your Dr. says you will get addicted to it "you won't", however, you may get addicted to painkillers! I understand riding and horses and I know about the spine and how it works. Not all advice is correct and I have helped many exasperated riders keep riding or get back to riding with back injuries. Please contact me if you have a serious injury for medical advice as a horse rider. Wearing a Back Brace Can Keep you Active and Riding! The Brace will absorb the jarring impact and help support the lower back when horse riding. The footfall of the horse results in an equal and opposite force back on the saddle and through your joints. This force causes jarring in the joints. It cannot be avoided but it can be reduced by using a back brace. A back brace can complement core stability. The abdominal muscles wrap around the lower abdominal area. The back brace wraps around the same line. For riders with weak deep core muscle, a back brace can act as a support for the deep muscles and provide support and stability for the lumbar joints. If used in conjunction with the Applied Posture Riding program the low back support can be built up enormously through exercise and the back brace. Have a look at the video and see what is actually happening to your spine when you are riding. Measure around your hip and wear it in the same position. The brace is worn around the waist and hip area to provide support to the lower spine and pelvis. The brace 20cm wide so if you have a short trunk you will find the brace sits up near your ribs, this is OK. The brace will remain in position when you ride if fitted correctly. The brace has an overlap adjustment of 20cm so you may well fit into two sizes choose the smaller size if on the border. 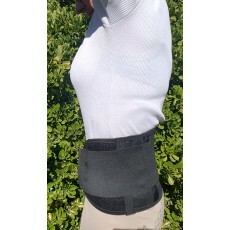 Horse Riders suffer back pain and this lumbar back brace is ideal for riding.